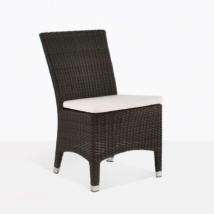 Simple, chic and modern, the Petra Wicker Dining Side Chair (Java) is a steadfast favorite at Teak Warehouse. Supported by an equilateral design, with a cushy Sunbrella® cushion, this European style outdoor dining chair will add style to any dining table. 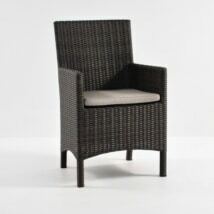 The Petra Wicker Dining Side Chair (Java) is a beautiful chair, simple enough to fit in many spaces but still making an impact with its elegant lines and robust frame. W19" x D21" x H36"
The Petra Wicker Dining Side Chair (Java) is supported by a Powder-Coated Aluminium frame, sturdy and strong – the powder coating means that it won’t deteriorate outside, and aluminium is a superbly built material to host the gorgeous Viro® Wicker! Viro® is an award winning product, well known for being made in an environmentally conscious workspace, and a protected polyethylene synthetic material that has been UV treated, and strengthened to withstand extreme temperature changes without cracking, morphing or discoloring. If that weren’t enough to sell you on the gorgeous Petra Wicker Dining Side Chair (Java), we also provide you with a FREE Sunbrella® pad with QuickDry® foam to complete the all round look, giving you extra comfort and a product that can stay outside, even through rain! At Teak Warehouse we care about providing you with luxury furniture at wholesale prices. We have worked our hardest to get a great range of marine quality products to turn your outdoor area into an extension of your living space! Along with Viro® Wicker, we also have Rehau® and new Ecolene® slimmer, contemporary looks of All Weather Wicker. If you are wanting to create a diverse blend of beautiful materials, we have a lot for you to choose from! How about an A-Grade Teak table with your Petra Wicker Dining Side Chairs (Java)? Or perhaps a chunkier, cool Raw Concrete style for a bit of a modern edge to your space. We have sun loungers, relaxing chairs, bar furniture, dining tables, deep seating, umbrellas, pots and planters all in a great array of fine materials! Among our favorites, we have Reclaimed Teak, Textilene® and Batyline® mesh, #316 Stainless Steel, and Resin. Pop in to one of our stores, or call our 1-800 number! Our sales assistants are in store 7 days a week, available to help you with all your furniture needs! Mix and match with teak tables or concrete tables for an exciting and inviting outdoor look. 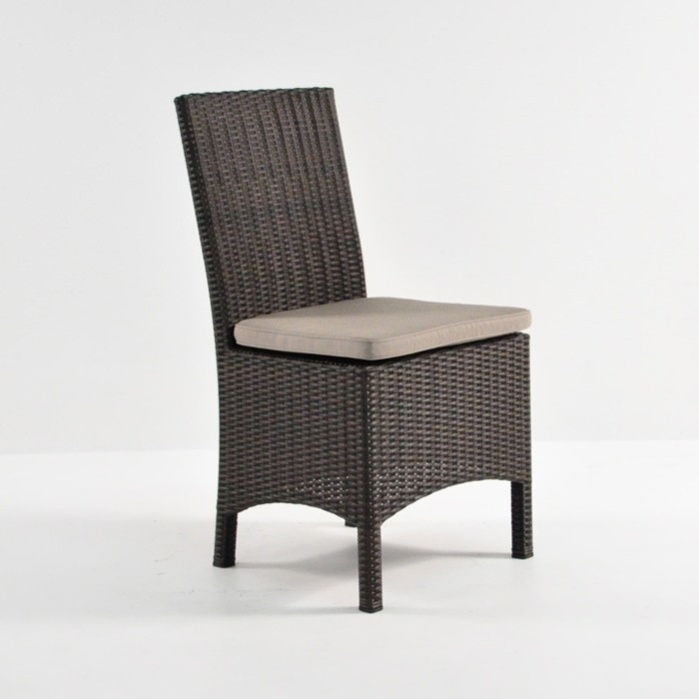 Try the Petra Wicker Dining Side Chair (Java) around one of our Rectangular Tables for a superb, linear composition, ideal for big dinner parties and long, comfortable hours outdoors. After a setting that is more contemporary? Choose one of our Raw Concrete Dining Tables surrounded by Petra Wicker Dining Side Chairs (Java) for a rich, stylish and tres chichi outdoor dining set! Place four Petra Wicker Dining Side Chairs (Java) around a bistro type of table for a smart café setting for your patio or porch. Have a commercial space? Repeat this set, adding in Sunbrella Umbrellas as necessary to ensure your guests make the most of their time in your establishment. The opportunities are endless with this attractive design… you can even use the Petra Wicker Dining Side Chair (Java) indoors, adding a modern element to your surroundings. Imagine these easy to care for chairs surrounding your kitchen dining table, or in your sunroom with a Reclaimed Teak Coffee Table, adding a simple and stylish dimension to your indoors and creating a fuss-free area you can unwind in! The Petra range is made from superb, marine quality Viro® wicker, through-dyed and UV treated, making it ideal for outdoor use. 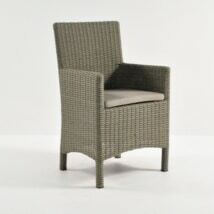 The Petra Wicker Dining Side Chair (Java) is supported by a powder-coated aluminum frame, includes a free Sunbrella® cushion and is also available as an arm chair. Call us now to find out what other options can match up with this unique outdoor dining chair! Our sales staff are in store 7 days a week and happy to help you with all your outdoor furniture needs!